Soft drink brand Mountain Dew has found itself in the most embarrassing crowdsourcing debacle since Kraft’s iSnack 2.0. The fallout comes from a crowdsourcing competition started by a restaurant to find a name for its soon-to-be-released homemade green-apple-flavoured Mountain Dew concoction. 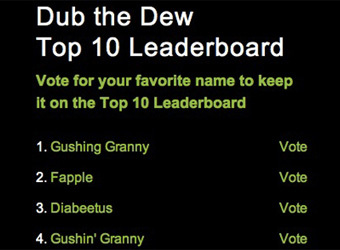 Labellled ‘Dub the Dew’, the competition was hijacked by internet sadists, resulting in submissions that may be amusing to others, but damaging to the brand at the same time. 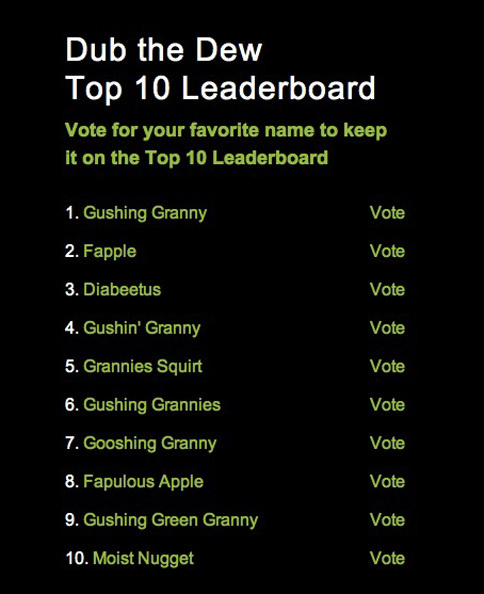 Names such as ‘Diabeetus’, ‘Fapple’, and ‘Granny Squirter’, populated the top ten leaderboard of submissions for the competition on dubthedew.com, a site that has since been closed down.